Here’s my theory: One reason parents/teachers/adults are spending so much time hovering over kids is that they are spending so much time hovering over kids. What I mean is: It’s a vicious circle. (Or cycle. Never figured that out.) Anyway, when we spend a lot of time watching our kids, inevitably we will see how often they do something dumb, mean, or slightly dangerous. Which makes us feel we have to watch them even more. 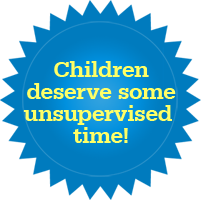 But if we WEREN’T spending so much time scrutinizing them — if we gave them decent dollop of old-fashioned, unsupervised time — we would see far fewer of those nervewracking, “teachable” moments, and hence not feel the need to supervise even more. Which brings me to this wonderful piece by Angela Hanson, whose book “Balanced and Barefoot: How Unrestricted Outdoor Play Makes for Strong, Confident, and Capable Children,” I eagerly await this spring. You can’t role-play empathy! Or lecture children to death on how important it is to include other children. Children need to learn these things through practice. LOTS of it! My heart is beating fast: She is so right! It’s not that Angela is saying don’t teach empathy. She’s saying that learning-by-doing is the best way to learn anything. Which we all knew, but sometimes forget — especially when we’re right there, ready to “teach.” – L.
First I go, then you go, then we ignore Charlie. Okay? I really don’t agree with this one. Yes, adults should give children the opportunity to work things out themselves first, and they should model and teach good problem solving skills so that kids can eventually settle things without adults. However, the “just let them work it out” approach (which everyone told us to do) was a disaster in my family. We tried it and every single time it led to one of my children escalating to physical violence and hurting the other. After my daughter started refusing to ever be alone with her brother because she was afraid of him hurting her, we started intervening much earlier in the conflicts. This has worked much better, and the kids both play together more and have better problem-solving skills. Maybe some kids benefit from the hands off approach, but some kids also need careful supervision and conflict-resolution teaching. If I was being hurt by someone who refused to stop, I would certainly not want the authority figures to tell me to just work it out myself. If an adult intervened all the children would have been told of “wrong” behavior. The girls saw themselves as being the ones aggrieved and defended their playing. Eventually they solved the problem by chasing the boy until he did return their jewels. Then they decided to bring him into the game. If they were all told of wrong behavior then the girls would be resentful toward the boy because he got them in trouble. the boy would then be looked at with a negative attitude that would, in all likelihood, caused him to further act out. That would be the takeaway lesson – that you can be punished for the bad behavior of others. Tern, I think the lesson for you is that each kid is different. If it’s not working try something else. I would not just let things happen for my son but he’s autistic and doesn’t have strong language/social skills. I hover more for him than I do my daughter, whom is a very different child in some ways. I feel that is part of free range parenting. Knowing your child and knowing where they are maturity wise in order to allow them freedom to figure it out. Glad you have learned you kids need some extra help. And maybe in a few years you can step back cause they will have had the guidance they need. Sorry, off topic, but not living in the US i am really keen to know what happens when all LA schools are closed and 640k kids are ? sent home ? are parents supposed to be contacted and alter their work or life schedule to pick the 640k kids ? are the 640k kids sent home on their own ? are schools not closed but left open until the 640,000th kid has been collected ? I agree with this one so much! Heather Shumaker has a great chapter on it in her book, “You Don’t Have to Share.” She argues that by preventing conflict between children from ever arising and quelling it as fast as we can, we’re badly stunting their fundamental social skills. At the playground, I’m the mom who sits at a bench 50 feet away with my coffee and my Kindle, which helps me resist intervening. (I would intervene if my son were hurting someone or bullying a smaller child, but that’s never actually happened.) But there’s a strong social pressure to jump in the instant a child doesn’t share the dump-truck he brought or let the other kid take a turn on the swing or says anything even a tiny bit rude. That’s what the hovering moms all do. And Tern, I think it depends on the setting. In a family, since siblings are usually of different ages, a parent may need to intervene and teach an older kid to be kind to a younger one. But on the playground, especially among age-mates, I think kids would benefit from a much more hands-off approach than what I currently see parents and caregivers doing. Even within the family, many parents intervene too much: I’m pretty sure my next-youngest sister and I would have a far better relationship than we do if my parents hadn’t forced me to ALWAYS include her. I had to bring her along every single time I played with a friend, which meant (a) I resented her, and (b) she was always the third wheel, since the youngest child in a group of three kids is usually lowest in the social hierarchy. As things were, the two neighbor girls near our age both considered themselves my friend and her a tag-along nuisance, whereas if my parents had backed off and let things take their natural course, we would almost certainly have paired off and each had a friend of our own. No girl (or boy) should have to put up with obnoxious behavior and be forced to “be nice”. Some behavior is just not acceptable. Ever. Kids are remarkably good at handling small conflicts and resolving them peacefully and correcting bad social behavior without us. An adult intervening and forcing the children to accept this bad behavior and “be nice” only allows it to continue and get worse. These small squabbles inevitably escalate the situation into something bigger than it was. It often encourages tattling too, something I loathe. There is middle ground between micromanaging kids and letting them entirely to their own devices. Supervise should not mean “interfere in every little thing” nor make sure everything is perfect. People who do supervision are too often afraid to let things be, because they will be considered lazy if they do. Supervise should just mean “have general idea about what is going on, whether it is pattern of aggression or run-of-the-mill conflict”. Let them work it out with no supervision at all can end up in peace and in most cases probably does. However, it may also end up with one kids dominating the other or a kid being bullied – and that is not exactly exceptionally rare either. Let them work it out works well for naturally dominant kids and kids who have natural talent toward everything social and I suspect it is those people who fondly remember that from childhood. It works significantly less well for kids that are shy, different then others (by interests or personality), slow to respond to insult, easy to scare by aggression, socially awkward or anything like that. It is simply not true that they would automatically figure out what to do by themselves. Those end up perpetual victims, because aggression against them is practically rewarded in a group of small kids that is unsupervised too much. Aggressor gets what he/she wants each time reinforcing the behavior and weaker kids get socialized into submissive position. I think that one of reasons for constant meddling is that plenty of people remember parts of their childhood sucking due to such situations. Just as some people remember how great school was and then barely dolls out that odd dorky or weird kid that had no friends or got picked on from memory, the dorky kid remembers mostly how bad it all was every day and how happy he/she was to get to college/job finally. @lollipoplover I agree. However, I think that it is not nor should not be given that interfering adult will just force those girls to be nice to boy who broke the rules. Supervising adult with different goals (teach kids to set boundaries against others) and values (being nice does not mean you should accept anything) could either support girls moral right or decide not it interfere since they are handling it by themselves. I think that part of that is the assumed goal of adult supervision is primary “make kids look nice and friendly” instead of those other things which matter too such as “set boundaries, yes you can push for your own opinions” and just help them solve situation if it goes very bad. I think the key is, you don’t intervene every time there’s a disagreement or someone says something rude or unkind. “Work it out” works really well until it doesn’t, and then the consequences are bad. For every ten situations where they work it out, there’s the one situation where one kid lacks the social skills, intelligence, emotional resources, whatever, to deal with what’s going on, and two things happen: one or more kids are made genuinely miserable over time, and one or more kids learns that they can be cruel without consequences. So I think you monitor things, but you don’t treat every instance of suboptimal behavior as needing intervention. You watch for patterns, not moments. I have a 3 yr old and an 18 month old. There are times when I intervene, mostly because the older one is so much bigger, and there are a lot of times when I watch from a distance to let them sort it out as long as there’s no violence involved. I agree that with age (and size) mates on the playground it makes sense to be hands-off as much as possible. That doesn’t mean ignoring bullying behavior! A lesson I learned in an early-childhood RIE course is that often direct intervention isn’t necessary– just physically moving closer so the kids are aware they’re being watched will often de-escalate the situation. Another thing I learned (and try very hard, often unsuccessfully, to follow) is to remain calm rather than yelling at the offender. Rather, simply calmly stating something like, “I see you both want that toy. Who had it first? Is there a way you can play together?” and NOT forcing sharing. If the would-be toy thief is mad, sitting by him and saying, “I know you’re mad you can’t play with the toy right now. It’s hard to wait your turn. Is there something else you’d like to play with right now instead?” Usually things settle without hitting. This is the sort of philosophy espoused by Laura Markham on her Aha Parenting website– very educational and great for setting the stage for being Free Range– getting kids to calm down, think, and make good decisions so you feel safe letting them do things themselves. I think this can go either way, actually. Parents tend to think their intervention is fixing things for the shy kid, but often it isn’t, and may in fact make things worse. E.g., you can’t actually make someone play with or be friends with someone else – that’s ALWAYS going to backfire. Children’s social interactions and social cues are pretty subtle, and adults tend to be heavy-handed and oblivious to 9/10 of what’s going on between them. I know that my parents’ intervention inadvertently trained my little sister into all kinds of problematic behaviors like whining, manipulating, and tattling, and also trained the rest of us to try to avoid her and exclude her in subtle ways they couldn’t see. @andy – yes, this exactly. Frankly, Lord of the Flies is at least as likely as a jolly hockey sticks Boys or Girls Own Magazine happy ending, when it comes to groups of kids playing together day after day. I think it IS a good idea to back off when conflict arises to begin with…..I would even sit back and let a few days of conflict happen.. (at school, I mean). But if you have a kid (or kids) becoming the constant aggressors, and others constantly attached the bottom of the heap, then it’s time for some intervention…might be something as simple as giving the bottom -heap child a few ideas. While I agree that parents should not jump in at first sign of conflict and should give the children a chance to work out their own problems themselves, I do question the notion that socialization should be left totally in the hands of people who have not mastered it themselves. It is not always the pro-social behavior that wins out. I’ve said this before, and will say it again. So much successful free range parenting is due to parents taking the time to help their children learn the rules of successful social interaction. Teaching moments are so artificial but a family that talks about and practices the basic rules of FairPlay and self control is a family whose members can use self regulation away from home. A kid may not want his brother tagging along, but will still watch out for him. Good parenting + Good kids = Freedom. I love this anecdote. As an assistant principal of a prek-8 school, I am faced with the dilemma of intervening vs. Interfering every day. There is wisdom in the article, but the real challenge is in passing on that wisdom to the genX – millennial parents I work with. Then it can feel like Galileo trying to convince the Church that the Earth is not stationary. At the school where I teach, there are two camps of teacher involvement in student disputes. I’m decidedly on the camp of “Barring serious bloodshed or serious bullying, let the kids figure it out.” I can always intervene when I feel it necessary, but why make it my default reaction? My 2nd graders took some time to learn I wasn’t going to jump in every minor quibble. Give advice when asked? Sure. But that’s it. I think letting kids work these out (and even not work everything out) sets the standards for acceptable behavior better than adults regularly stepping in. Want to play with the others? Best decide if that desire is stronger than your need to be a little turd. There has to be a happy medium of supervision and social coaching for young kids to work out their differences. Unfortunately, when most adults are trying to maintain the peace, children learn to rely on them to resolve their conflicts and don’t learn how to get along with others. I hate the “Be nice girls” as the go to intervention in this story as if teaching our girls to be passive and agreeable when a beet red boy is “dangerously close to them.” I don’t want my girls to take that kind of behavior. Ever. Children naturally set personal boundaries like not wanting a kid who cheats or plays dirty on their team and find groups who play like themselves. Some even prefer to play alone and there’s nothing wrong with that. Every kid is different but the “when to intervene” button often gets pressed too quickly when kids can naturally learn to speak up for themselves or get an adult to intervene before it escalates. Give them a little credit to handle themselves in social interactions and learn from their experiences, both good and bad. @Anna Intervention does not necessary mean force other kids to be friends with odd one. It could also mean that you will tell the shy one to defend itself or push back, praise kid the first time the kid try to defend (even if the kid fails), explain the kid what the problem was if the kid just don’t get social stuff by itself and so on. Optimally it would mean that you try to get what is wrong with either side and teach/raise the kid to handle the situation better. Punishment should be just one of multiple strategies even on the aggressive side and wont work by itself anyway. Basically, one should not primary try to fix it right now, but watch to see what exactly is going wrong and then seek to fix it long term. The key to this example is that the kids were unaware of any adults being around. If you feel that sometimes adults should intervene and sometimes they should not, then you are on the side that adults must ALWAYS be present so they can make that judgement call. The takeaway from this article should be that adults do NOT always have to be present. I’m with Andy on this. A totally laissez fair approach to squabbling can leave some children in a constant under dog position, and that’s not a good place to be, especially if it’s sibblings. The key is to recognize when you’re needed, build the kids’ own skills in negotiation and then give them space to practice, not always be jumping in. I think we’re actually all agreeing on this, and I didn’t see Lenore as saying otherwise, either. To me, a “squabble” is a minor dispute, not a knock-down fight or a long-standing pattern of bullying. And at least where I’ve lived, what I see happening around me is generally way too much intervention, not too little. I see parents routinely intervene on what amount to questions of playground etiquette, rather than morality. @lollipoplover I fully agree and a lot about not to teach kids to be passive and agreeable when a beet red boy is “dangerously close to them”. That kind of expectation hurts girls (and boys) in the long term. Yes, it is important to know how to solve conflict without unnecessary fights, backing away each time is not a good way how to go about it. Also, I think it would be very extraordinary of that boy would be really dangerous. I really do not think there was danger of injuries or anything like that. If yes, then there is serious problem with the boy that needs fixing and “play nice” wont solve it. Not necessarily. You’re only saying that adults must have some level of awareness of what goes on from day to day between kids. You don’t need to hover, but you shouldn’t be totally checked out of things that go on among people who haven’t yet mastered the art of getting along with others, some of whom may be able to inflict real damage on some of the others. So pay some level of attention, leave them to themselves sometimes, and when you become aware of a situation that requires adult wisdom to keep from getting totally out of hand, take some appropriate measures. In LA, will this be a day for free range kids? I live in Pasadena, the next town over from LA, and received a Facebook post and phone call that my school will stay open. Regarding your comment – it isn’t 640 kids, it is 900 schools and 640,000 children. They were told not to come to school and those who had already arrived were told to go home. parents had to pick them up or they could take the metro free with school ID until noon. Pretty terrible, isn’t it. School officials will be dealing with the fall out for days. Keep in mind — 900 schools closed. fIs this a day for free range kids? What i parents can’t pick up a kid? Museums have announced they will be free all day for children in the LA area. It is a reminder that parents should have a way for their children (above a certain age — what is that, up to the parent) to get home unaccompanied, by foot or mass transit. LA USD is the second largest school district in the country. NY is the first largest. NY also got an almost identical email, but that superintendent thought the email wasn’t credible. Here in so cal, the memory of San Bernardino shooting is too close in space and time to take risks. Story of my life! I have spent years trying to “train” my neighbors in this concept. Very important to not be constantly supervising…and a generation ago, they didn’t. Moms had their own agenda and kids had theirs. Now my youngest is 10 and really doesn’t need much supervising outside anyway, but this used to be a huge issue in the neighborhood. I was the one who stayed inside and let the kids figure things out, while 2 or 3 other Moms watched every interaction. Very awkward. They didn’t appreciate my “obliviousness” and I kept explaining that I like to let the kids solve their own problems. We got past it, but that is a very difficult situation. World agencies whose expertise is on the plight of street children claim that street children are actually very good at learning conflict resolution. Since no adults are around supervising them, they have no choice but to learn these things on their own! Shy of an actual violent confrontation stay out of it. Do not intervene, but rather talk with your kid/s after the incident. Use it as a teaching moment. Intervening during the incident can result in more harm than good. Consider that when trying to put an end to such incidents, at the time, you basically have to take one side over the other. Making one right and one wrong. Now after when heads are cooler, that can be discussed and explained. During an incident, all the kids will see is Mom or Dad said so and so was right and I was wrong. That is human nature. One rule we always tried to live by as adults was never call out the other parent, while that parent was dealing with anything. If you disagreed, wait until it was done, give it a few minutes and take up the disagreement in private. Cooler heads make for more rational discussions. Which in turn makes for better understanding and better results. As for the closing of schools in LA………….you are going to see more and more of this. People in the US are scared, or better yet terrified. Basically saying that terrorists have achieved their goals. I’ve found more parents request interventions at very small conflicts. My youngest (9) has a classmate who had a confrontation at recess with a group of girls. This girl was leaving comments like “you have an ugly duckface” on her classmates Instagram posts (don’t get me started why so many of these young girls are on social media in the first place) and the girls wanted to her to stop. So they all asked her directly to not leave nasty comments. She sulked a bit about it but apologized and said she would not leave any more negative duckface comments. Conflict resolved, right? No. The girl told her mother about this incident and the mom contacted the school about her daughter being bullied. The guidance counselor got involved and several sessions were spent with this class about social media practices (How about not having an account if you aren’t mature enough?!) and bullying. My daughter (who does not do social media) thought it was all a very big waste of time as it was already resolved at the kid level and the adult intervention just fed into the attention-seeking behavior of this classmate who has a taste for drama. I like it. I can see that Angela has grown up with some great modelling of respectful, inclusive behaviour. 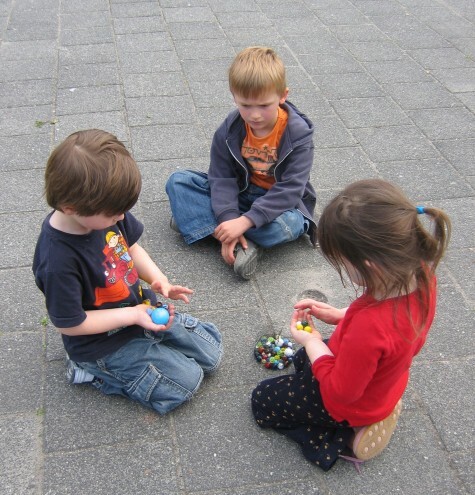 Starting from about age 2 when my daughter started having playdates I noticed the kids played more nicely together the less I watched over them and the less I intervened. Of course kids should be taught the importance of sharing, etc. but they learn to do it better when they play by themselves. At my daughter’s playgroup years ago, one mom said, “I don’t think it’s right that we make the little ones share so much. After all, we don’t share our stuff!” Made me smile then; makes me smile now remembering it. Used to see a mom all the time years ago that forced her kids to share everything, and tried to make all the kids around her kid be the same way. Another friend of mine finally having enough walked over and took this mom’s cup of coffee and took a big swig. Telling her, “Everyone has to share, right?”. I damn near choked on my coffee I was laughing so hard. Assuming that kids have had a good, basic education in communication skills, elementary logic, and group or community participation, they should be left free. But many kids don’t get a good, basic education; they are merely taught to obey authorities blindly, because their parents and other teachers are incompetent (poorly educated themselves). Yes, modern parents tend to err on the side of interference, and their kids could end up missing some social skills – However, this is definitely one of these “damned if you do, damned if you don’t” areas. I grew up in a “children should resolve all their problems among themselves and never snitch” culture, and, believe me, it can turn rather ugly, with rigid hierarchies, bullying “outsiders”, etc. sexhysteria has a good point. We (adult population in general) may find ourselves feeling we ought to intervene more because these youngsters truly don’t have the greatest social skills because for whatever reasons they were never taught these social skills. Don’t ask me where the cycle starts or the original cause of it. It was crazy. Long story short, I was badgered into “having a talk” with my daughter who said she had absolutely no problem with the friendship between the other girls, liked them both, didn’t feel left out, didn’t want to exclude either of them herself. Not only did nothing “need to be done,” there wasn’t even a problem. Warren: to give credit where credit is due, that comment was excellent. and to continue what you have said, and to support the original article. I would suggest that many times the lack of skills to deal with this stems from the vicious cycle mention in the opening article… if we don’t practice the skills we won’t have them when we need them. If the kids don’t get a chance to practice conflict resolution – then they are predominantly going to be bad at it and require more intervention, or escalate into unacceptable behaviour. Or put simpler… practice makes perfect, and we parents need to be sure to let the kids practice. It is interesting how black and white the issue seems to be, almost like the options are to completely intervene or to completely ignore the kids (to the point of allowing bullying etc). I am with the responses that support parents being parents… to varying extents, depending on the age and abilities of the child, we as parents are always somewhat aware and involved in what is going on. I try to intervene as little as possible, to give my kids a chance to grow, but I am fairly aware of what is going on, and the kids are aware of the expectations that I have. Quite often my best friend and I will pause our conversation and focus on a conflict between our children. Together we decide if intervention is needed, and what kind (sometimes just the “Teacher Tom” method is amazing, if you don’t know him he basically just aides communication between the children), less often a more authoritarian method is needed, sometimes a kid will come find us and we will give them additional advice (ie to my 3yo I might offer some words to say or methods to use to share a swing) and let them run back and apply it. As the kids have gotten older they have developed more skillful methods of dealing with the conflict, so that more often then not we don’t need to intervene at all. My point, I don’t think anybody is arguing that sitting back = kids who bully. I think that is another extreme (and also I want to add that hovering doesn’t seem to stop bullying either). This seems like another one of those cases where the correct approach varies considerably depending on the children involved. “Let them be and they’ll work it out themselves” may be true for some, and not for others. @Cassie Through, in that particular story, the least amount of social skill were displayed by overly dramatic mama who grew up in different era. It is story about kids with alright social skills and a parent with less of them :). This reminds me about timae I was watching a six year old and a toddler playing at separate sides of a lego table. Everything was fine until the toddler grabbed a piece that the six year old needed. He asked her very nicely and even offered her another “better” piece, but toddlers can be adamant. He gave her the piece with the stipulation that he needed it back in a few minutes. Predictably, the toddler was unwilling to relinquish the piece and after once again being nice, he grabbed it from her. Of course at the moment the toddler yelled MINE Mom comes by and tries to force the six year old to be nice and give the piece back. I used to always think of this episode when other kids would come to me to fix their disputes. My standard response was that I wasn’t there and work it out with those involved. Other parents don’t always appreciate this and try to figure out what happened and who was to blame and how to fix things. This never seemed to work as no kid will admit to being at fault and you get different version of the truth from each of them. It just wound the kids up more and set them up to be against each other. My sons tend to get along most of the time, but when they have had it with each other, they tend to get physical. For years, we would physically separate them when they were trying to kill each other. Me: What happened to your neck? Son#1 (mumbling): Me and Son#2 had a fight. Me: Hmm. Hope you worked it out. Since that time, we have had exactly one major blowup in about a year and a half. And in that blowup, son #1 punched a window rather than his brother. Now, broken windows are a serious pain in the neck, and you can bet that came out of his allowance. But that one unsupervised knock down drag out fight made them both realize “Oh sh@#, we can really hurt each other when mom doesn’t break it up”. Son #2 is now much more likely to retreat to his room when his brother is irritating him, and son #1 is much more quick to apologize. Do I want my kids hurting each other? Absolutely not. However, in this instance, a little pain accomplished what years of sending them to their rooms did not. I grew up with an older sister who was a huge bully, who constantly put me down and encouraged her friends to do the same. My parents often would either take a completely hands-off approach or punish us both equally regardless of who started the fight. There were times when I really wish my parents had intervened more. There are times when it is appropriate to intervene in kids’ conflicts. It’s not a question of always intervening versus never intervening. Adults need to have a more nuanced view of the situation and be able to recognize normal behavior from situations where one child is consistently and repeatedly being victimized. All of a sudden, my mom screamed at us to get inside immediately. She rarely intervened in my affairs at that age so I couldn’t figure out what she was so mad about. She demanded that I go back out and apologize to the girls and tell them I had been mistaken and they were allowed in my yard whenever they wanted, even if my sister and I weren’t home. I begged my mom to reconsider because this was ridiculous and not the way the world worked in my view. But my mom stood firm, explaining one of the girls was our landlord’s daughter and therefore she really could come over whenever she wanted as the property belonged to her more than to me. This was a very accurate lesson about the relationship between money and power, and it taught me that having no money or wealth is intricately entangled with powerlessness and humiliation. Excellent point, Warren, about talking to your children afterwards. Everyone, including the original author, is assuming that these kids with very little life experience in human interaction have come to the same conclusions and learned the same lessons that we with many years of life experience in human interaction have. It is as likely that boy has no idea what he did to upset the girls. It is also possible that he does know, and instead of concluding that he should be nicer, he has concluded that he can be a jerk, and, as long as he pouts afterwards, he will be invited back to play. Since we came in mid-argument, maybe the girls were treating him meanly for no reason and being nice should be discussed with them. Maybe the girls were showing empathy and maybe they thought they were going to get in trouble for excluding him so decided to include him. Maybe the other girls forgave him and wanted him to rejoin the fun, or maybe they had no desire to play with him any more, but were forced into it by the one girl who wanted him to play. Maybe they never wanted him included at all and were forced to by one of the girls who is bullying all of them. The fact is that we have absolutely no idea whatsoever as to what is going on in the minds of these kids, but we have concluded that they learned all these wonderful pro-social lessons from the interaction. 2. the children are not in a place to use those skills at this moment. Children develop and strengthen brain connections through their experiences. If they experience being unkind or aggressive, that’s what strategy is being strengthened in their repertoire. IF they handle a conflict respectfully, that is what they are practicing, and that is the skill being strengthened in their repertoire. Ideally, we want to minimize the number of times children are unkind or aggressive, and maximize the number of times they are kind and respectful. If we intervene too soon, we risk denying children the chance to practice kindness, compassion, and respectful, assertive conflict resolution. But if we don’t intervene at all, we risk allowing them the chance to learn unkindness, disrespect, and aggressiveness. The most important piece is HOW we intervene when we do. Intervention should walk children through the conflict resolution, rather than preaching, lecturing, scolding, decreeing or solving the problem for them. The adult is most helpful to children’s development of the kind of self-assessment, reconsideration, and compassion this little girl showed when we act as facilitator, or interpreter, not judge or director. Then we can be helping them to practice mutual problem solving, and to leave the interaction feeling positive, capable, and kind. @Catherine Caldwell-Harris….I know it’s off topic, but I do find it fascinating that museums, subways etc were still advertising that children could go free etc. Were I to bother with making the most disruptive mess possible (which seems to be the goal of ‘terrorists’) I would thank the LA Dept of Public Schools (or whatever it is) and head down to my local museum or subway. Also, as awful as the San Bernadino business must have been to those involved, evidently you’re still in more danger from the population of North Carolina than from any homegrown version of ISIS…(though I read that they have recently arrested 6 Americans in NC for plotting to work for ISIS overseas). Anne McCaffrey describes a similar, fictional, incident in her series “Freedom’s Ransom”. Thank you for this insightful information. It is important to allow children or individuals of any age to learn their lessons where they can without interference. Naturally if a facilitator is invited to support a student, and or is being bullied, perhaps it is important to notify other facilitators and divert the child to a quiet chat about what may be bothering them and other ways to resolve conflict.